A classic Mexican dish popular on Cinco de Mayo with green poblano chiles, white walnut cream sauce, and red pomegranate seeds depicting all the colors of the Mexican flag. Cinco de Mayo commemorates the defeat of the French army by the peasants of Puebla in 1862…shortly thereafter the French army triumphed again to overtake the country. Mexicans celebrate Cinco de Mayo because of the heroic efforts of the peasants, the holiday has nothing to do with mayonnaise or Mexican Independence Day. Everyone is a little Mexican on Cinco de Mayo just like everyone is a little Irish on St. Patty’s Day. Parties abound at pubs, restaurants and homes. You can have your own party and celebrate this fun holiday with mariachi music, dancing, sombreros, margaritas, lots of flamboyant zinnias, piñatas, and wonderful Mexican food like this chile stuffed with beef or pork picadillo. Roast chiles over a flame or under a broiler until blackened. Let rest in a plastic bag for 5-10 minutes. 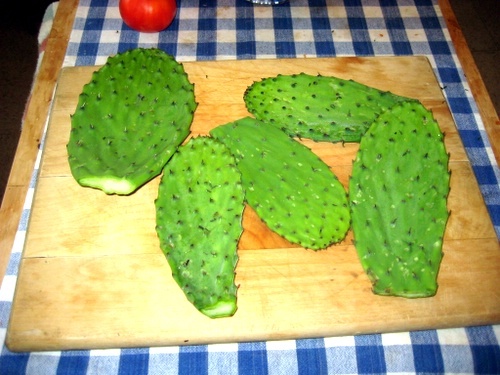 Remove skins, slit open one side of each chile and remove the seeds and veins. Warm oil in a skillet over medium high heat, add meat and brown until nearly done. Add the garlic, onion, apple, almonds, spices, raisins, and cilantro. Cook for 5-7 minutes. In a medium bowl, beat egg whites until stiff peaks form, sift flour over egg whites and fold in, then fold in beaten egg yolks with a pinch of salt. Warm 2 Tbsp of oil in a skillet over medium heat. Stuff chiles with meat mixture, dip each stuffed chile in the egg mixture and fry until golden brown, turning once. Whisk sour cream with evaporated milk, add walnuts, sugar or honey, and pour over hot chiles just before serving with a sprinkle of pomegranate seeds on top. Serves 6. St. Patrick is best known for chasing the snakes out of Ireland. That’s a bit out of context as most of our folk lore. St. Patrick was actually the first Roman Catholic Bishop of Ireland in 438 A.D. and responsible for purging Ireland of pagan rituals which were symbolized with serpents. There are not now, nor have there ever been snakes in Ireland, not of the reptilian sort anyway. A traditional Corned Beef and Cabbage Boiled Dinner is a ritual in itself for any Irishman, lephrecon, or sympathetic and enthusiastic friend of Irish ways. Be sure to bake a round of Irish Soda Bread for this festive occasion and don’t forget the horseradish. Rinse brisket in cold water. Place in Dutch oven or large sauce pan, cover with water, bring to a boil, then simmer for 20 minutes. Remove meat, place in fresh water with onions, carrots, potatoes and pickling spice. Bring to boil, then simmer until tender, about 2 hours. Remove meat and vegetables. Bring water back to boil, drop cabbage in for 5-7 minutes. Remove cabbage and drain before serving. Serve with creamy horseradish and mustard. Sift all dry ingredients together in large bowl. Make a well in middle of flour mixture and pour buttermilk into well. With a wooden spoon, mix just until all ingredients are moistened. Turn out onto lightly floured board and kneed 10 times into a ball. Place in ungreased pan, dust top with a little flour, score a cross on the top with a sharp knife blade or razor. Bake in oven 375° F. for 40 minutes. Serve warm. * substitute 1-1/2 cups yogurt and 1 cup water for buttermilk.